Forget mint chocolate chip ice cream. With these you basically get that ice cream plus a delicious chocolate cupcake in one. 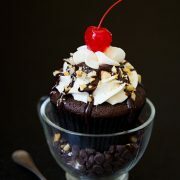 No the frosting is not ice cream but it tastes just like it and can also be spread over a cupcake to look like it. I want to eat it by the spoonful, as if it were ice cream. 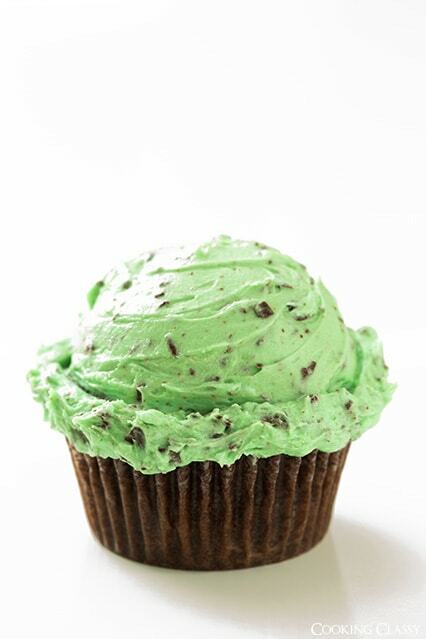 I used my favorite fluffy buttercream frosting for this recipe (because it’s my favorite, obviously) and I adapted it to be mint chocolate chip. 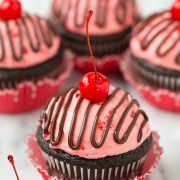 If you really want a cupcake that people will talk about, cut out about a tablespoon of the cupcake on the top, in the center, and spoon in some dark chocolate ganache. You’ll make friends for life with anyone who tries one :). Really they are so good they don’t need the added bonus of a rich ganache filling, so make them without it and you’ll still fall in love. Enjoy! 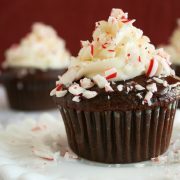 Soft and fluffy, deliciously chocolatey cupcakes covered with a sweet and creamy mint buttercream. Divide batter among 12 paper lined muffin cups and bake in preheated oven until toothpick inserted into center comes out clean, about 19 - 21 minutes. Remove from oven and allow to cool in muffin tin several minutes before transferring to wire rack to cool. 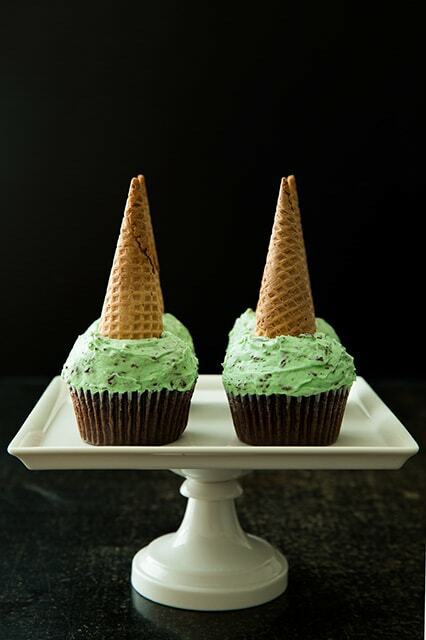 Cool completely then frost with Fluffy Mint Chocolate Chip Buttercream Frosting. Store in an airtight container. In the bowl of an electric stand mixer, using the paddle attachment whip butter on medium high speed until nearly white and very fluffy, about 7 - 8 minutes, frequently scrapping down the sides and bottom of the bowl. Blend in mint extract and vanilla extract. Add in powdered sugar and heavy cream and mix on low speed until combined. Blend in food coloring then increase speed to medium and beat until very light and fluffy, about 5 - 6 minutes, frequently scraping down the sides and bottom of the bowl. Fold in chopped chocolate just before spreading frosting over cupcakes. *If you would like the same amount of frosting as that pictured I would make 1 1/2 of the frosting recipe. **Be careful not to melt the butter if softening in the microwave. I like to let mine either rest on the counter and come close to room temp or in a rush, place it in the microwave, unwrapped and resting in a small bowl and heat in 4 second intervals rotating between intervals until it's somewhat soft. Mimi: Well, I am so sad, I went to the grocery store to make these for St. Patrick’s Day, since I have shelves filled with wonderful extracts, including peppermint, but of course you said don’t use that. I went to FIVE stores, talked to managers and everyone, they all said there are different kinds of mint, so which do you want? I just cried at the 5th store.